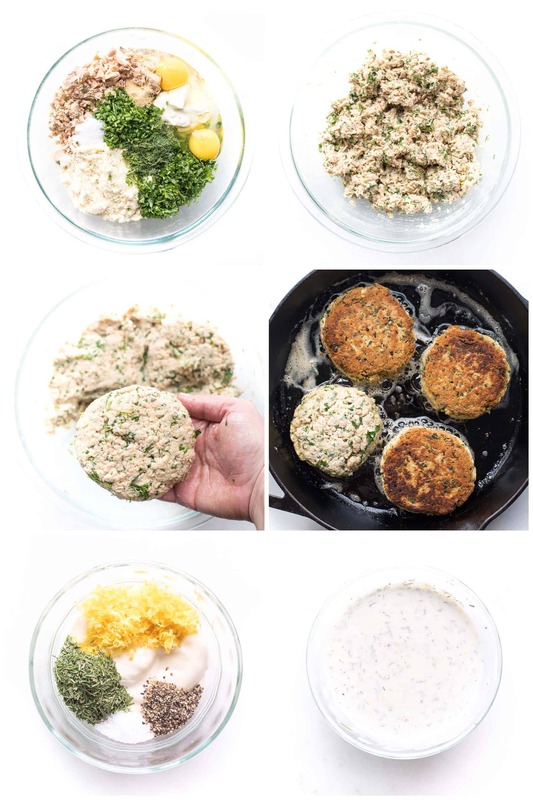 Paleo + Whole30 Salmon Cakes – healthy and delicious salmon cakes made from canned salmon, topped with a lemon dill aioli. Ready in 20 minutes! Gluten free, grain free, dairy free, sugar free, clean eating, real food. You know that canned salmon that’s right next to the canned tuna? 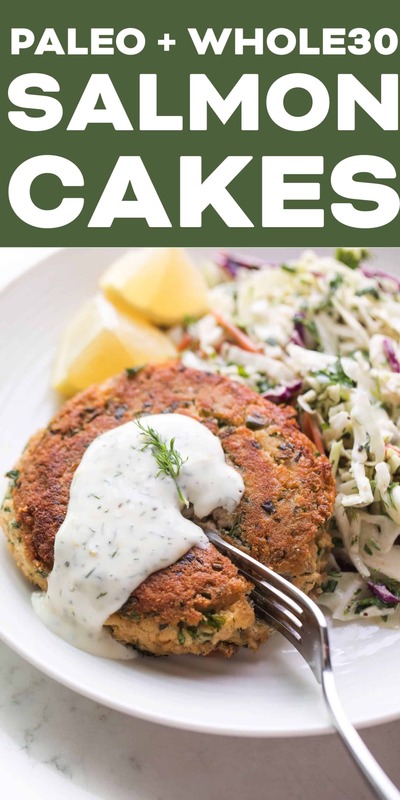 It makes the absolute most delicious salmon cakes and is in no way gross! Who knew? When I was doing my oh-so-extensive Whole30 Trader Joe’s Shopping Guide, I noticed the canned salmon and challenged myself to come up with a recipe for it. These paleo + whole30 salmon cakes are life changing. It’s like a crab cake, but made with salmon. Promise you’re going to love. 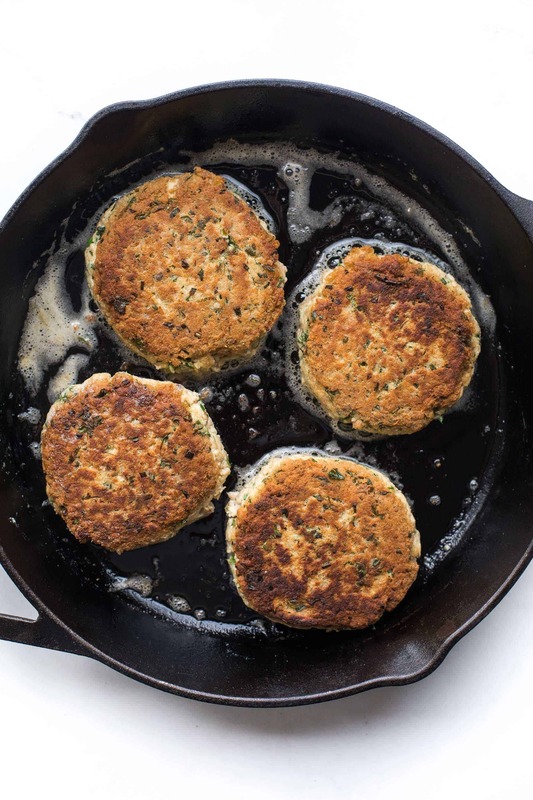 Salmon cakes are usually made with bread crumbs. But I swapped it for almond flour and it was perfect. 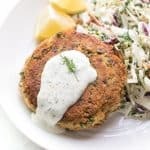 I added in tons of fresh herbs to bring brightness to the salmon cakes, and some of my homemade mayo to keep it juicy. 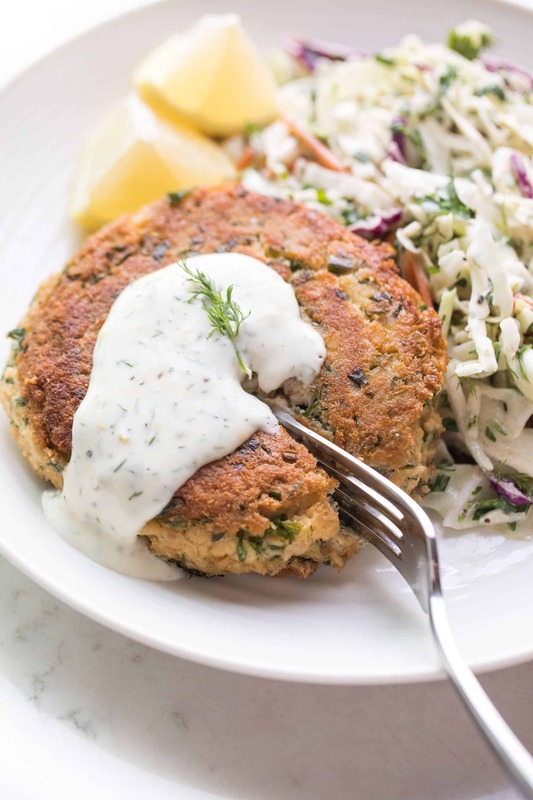 While the salmon cakes are getting golden and perfect in the cast iron skillet, I whip up a fast lemon dill aioli to serve on top. Since the salmon is already cooked, you’re really just browning the cakes and warming it through. This dinner honestly takes 20 minutes start to finish. I’m going to have to insist you also make my paleo + whole30 herby lemon coleslaw to go with it. It’s kind of the perfect meal. You’re already chopping herbs, just chop a few more for the coleslaw. 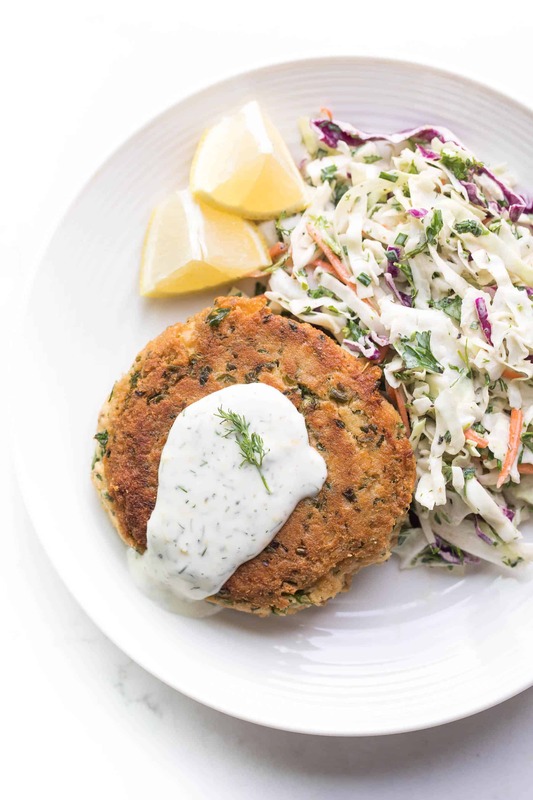 If you make the coleslaw and the salmon cakes together (which you really should), you’ll need exactly 1 batch of my homemade paleo + whole30 mayo for the coleslaw dressing, to use in the salmon cakes, and to make the lemon dill aioli. Don’t you love when it works out like that? 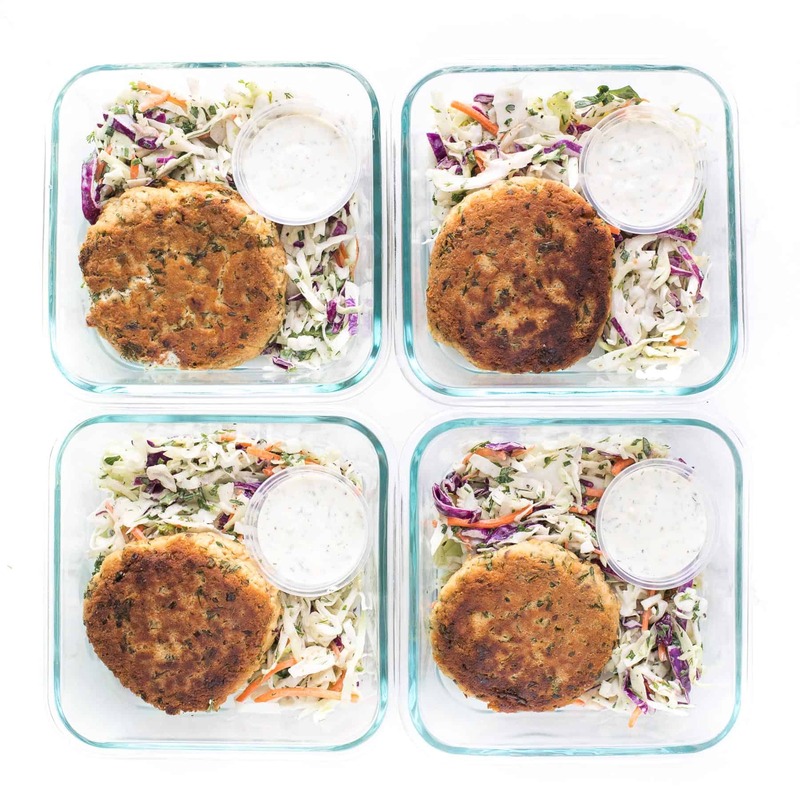 These salmon cakes and coleslaw make a great lunch or dinner meal prep! See recipe notes for meal prep instructions. 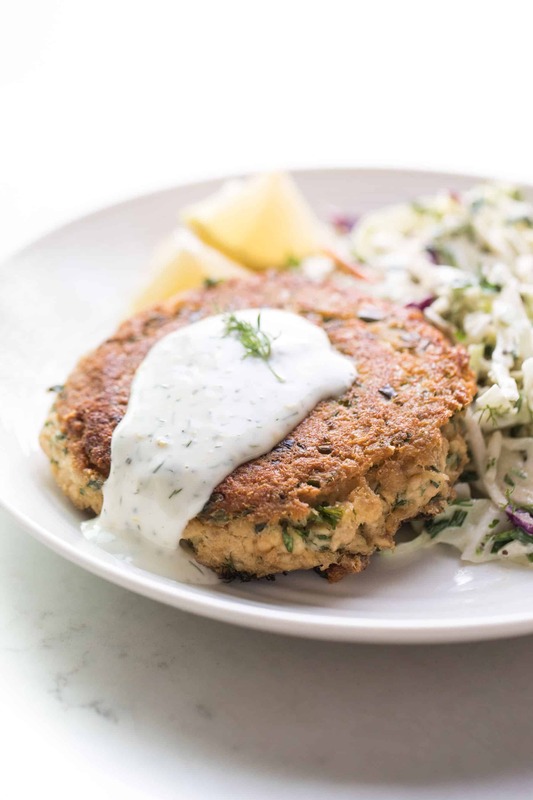 You’re going to love feeding your family these clean eating, paleo, whole30, gluten free, grain free, dairy free, refined sugar free, real food salmon cakes. Thanks for sharing; this sounds absolutely delicious and I can’t wait to make it! Can I use fresh salmon instead of canned? If so, what if any alterations need to be made? Thanks Molly! It’s so good! And yes, you can use fresh salmon too! I would cook the salmon first, then chop it really fine and follow the rest of the directions. Perfect use for leftover salmon! These salmon cakes look so nicely golden crisp and delicious.We’ve become big fans of salmon cakes around here. Definitely going to have to try this recipe, especially with that lovely aioli! Thank you so so so much Mary! Can’t beat that golden crust. Hope you love them when you make them! Husband and toddler approved. So glad I tried these last night, I have never enjoyed a fish cake in my life until now. I LOVE them! Yea! So glad to hear it! It’s delicious, right? Thanks for making my recipe and letting me know you like it, it makes my day to hear it! So glad to hear you liked them Leslie! And that they were easy for you! Good luck with your 2nd round of Whole30! Rooting for your health journey! So glad you like them Ingrid! I’ve never thought of baking them. It could work! I just love that golden crust so much, so pan frying is the way to go for me. But baking should work. I’d probably do 350ºF for 15 minutes. Just a guess. If you try it and it works let me know! these look amazing, wondering if they’ll freeze/reheat well or if they’ll get a weird texture after? not sure if you’ve tried it, but just curious. thanks! I’ve never frozen them! I would think they would be ok? If you try it let me know! Ahh…I need to research the canned salmon more! I mixed all the binder ingredients and then opened my can to discover it was basically a whole portion rolled up and stuffed in a can…bones, skin, and all, and it was scary!! I’m debating whether to try canned tuna or cook and chop the frozen salmon I have. I love everything of yours I’ve tried and I know this will be no exception, once I iron that out. Haha! Yes! Some cans have the skin and bones in it. It’s more nutritious! The bones and skin should dissolve right in. But definitely doesn’t sound the most appetizing, haha! You can look for canned salmon that says “skinless + boneless”. This recipe also works great with tuna! I made this tonight and even my fish hating husband liked it! Kid friendly too! Yea yea yea! I’m so glad you and your husband liked it! This just made my day! Thanks for taking the time to let me know. Means the world! These were delicious! My favorite way to eat salmon! Is there any way to make these AIP?